If there are other terms which are not clear then email me and I'll add them to this list. This is the normal hit with each hand while idling. The palm of the hand doing the hit is usually faced up, or almost facing the devilstick for the hit. For this hit the back of the hand is up and facing the devilstick for the hit (similar to a backhand hit in tennis). An example of this hit is in the mills mess trick. The right hand is crossed over the top of the left hand and hits the devilstick back to the right side. This is a right backhand hit. And here is a left backhand hit. 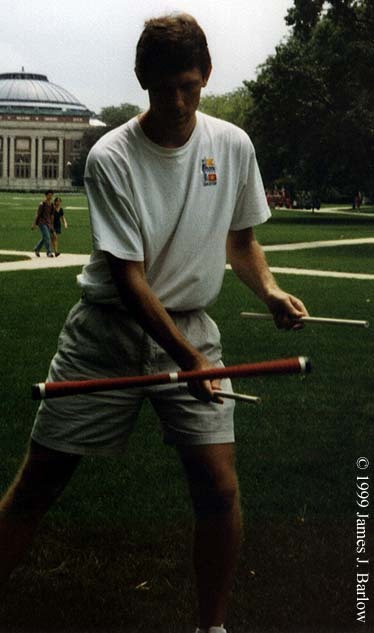 This is the standard devilstick hit between the two handsticks. This is the first thing taught when beginning devilsticking. It is also called the tick-tock. I like the term idle better because it describes a state of rest (I also unicycle and the term is used for staying in one place). I first gleaned this term from Seth Golub's devilstick pages. This is a a way to describe a certain side of the handstick when the handstick is being held in the middle. The front side of the handstick is the part of the stick extending out of the hand between the first finger and thumb. This is a a way to describe a certain side of the handstick when the handstick is being held in the middle. The back side of the handstick is the part of the stick extending out of the hand from the pinky finger. This term is used to describe the motion the devilstick can take on a handstick. Normally the devilstick is tossed back and forth between each hand. 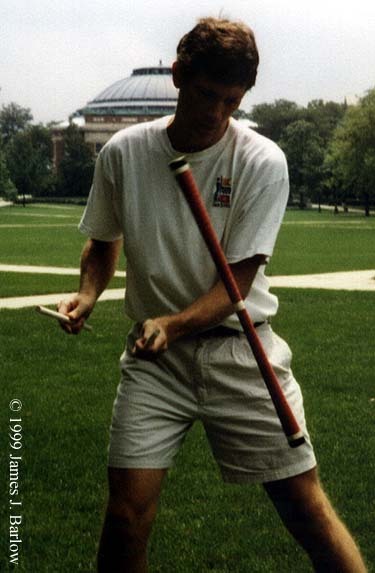 After the devilstick is tossed from the left handstick, rather than catching it with the right handstick, have the right handstick "catch" or make contact in the middle of the devilstick. This will cause the devilstick to continue to turn over the handstick (or "rollover"). If you let the devilstick continue the full roll it will then fall off the handstick. That half to quarter roll it takes on the devilstick I call a rollover. It can be done in many different positions and during different tricks.